Rie uses watercolor, colored pencils, and pen for her whimsical cat series. Printed on photo paper, each little scene tells a part of a story. 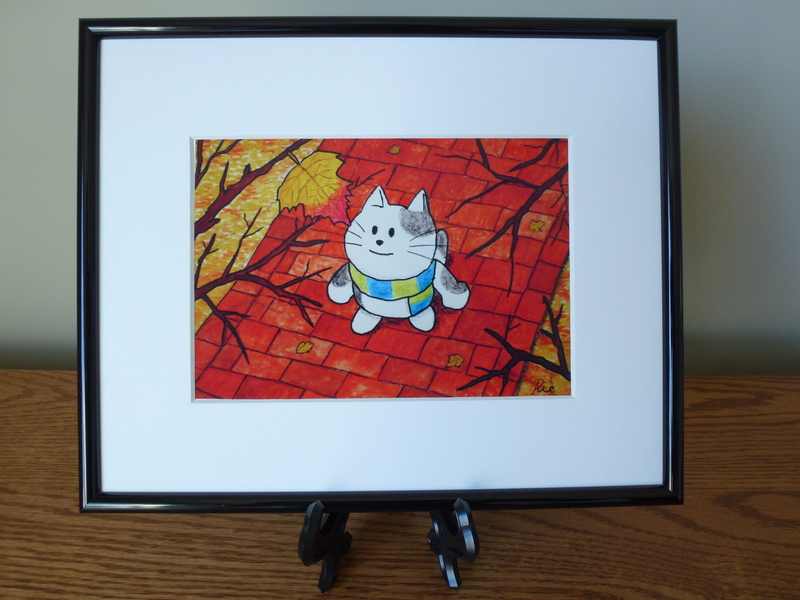 Perfectly suited for cat fans, for a nursery or child’s room, or for a small area needing a splash of color and a bit of fun. 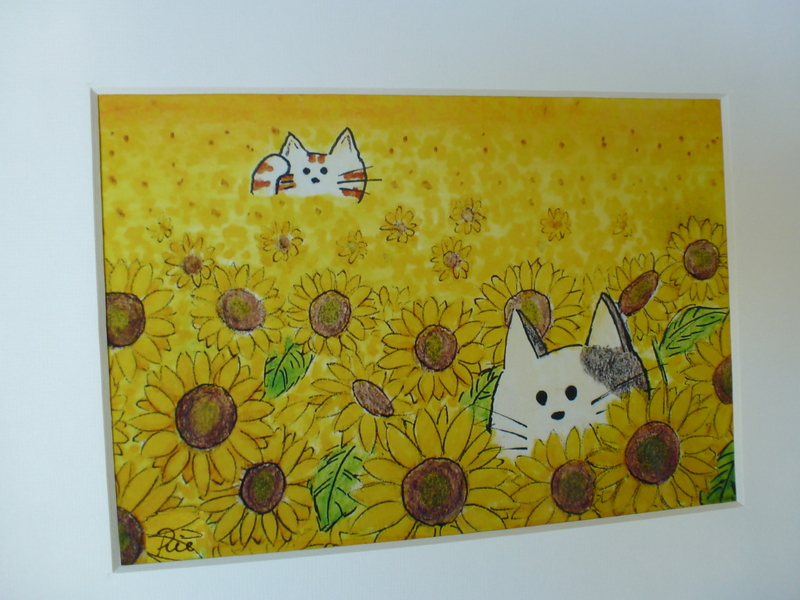 Rie’s kitty keeps busy and is illustrated in different situations during various times of the year. The changing seasons remind me of the unchanging regularity of this world that God created and of the lasting happiness that’s found in God and not in the world. It is here in Ecclesiastes that we read Solomon’s story – his search for happiness. He eventually realizes it’s all about God. From our point of view, life can seem completely meaningless but from God’s point of view, life is meaningful. 13 The end of the matter; all has been heard. Fear God and keep his commandments, for this is the whole duty of man. 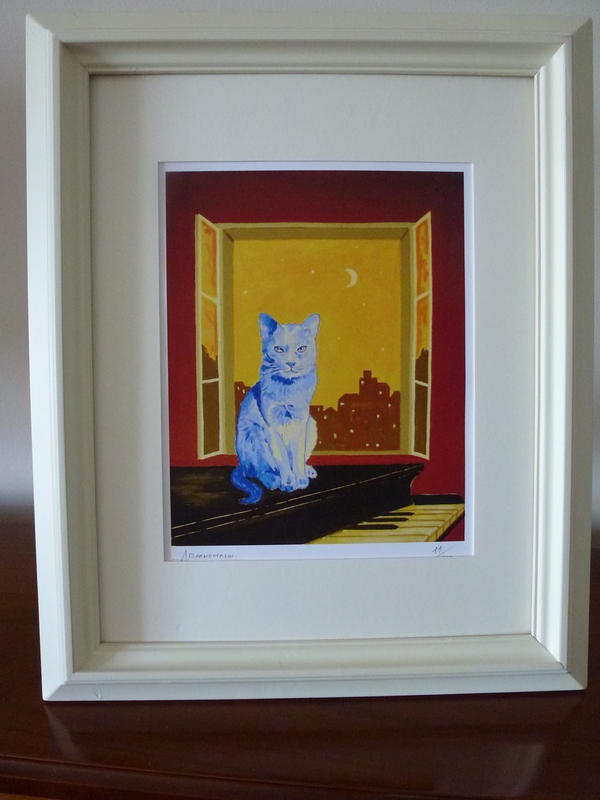 I was born and raised in Japan and studied silk screen printing and cloisonne besides oil and acrylic painting. I moved to USA long time ago after college. Drawing is my favorite thing to do since I was little. I also love photography of nature and animals, and I have fun finding beautiful and unique photos. I have been selling my artwork since 2010, and I love making people smile with my characters. 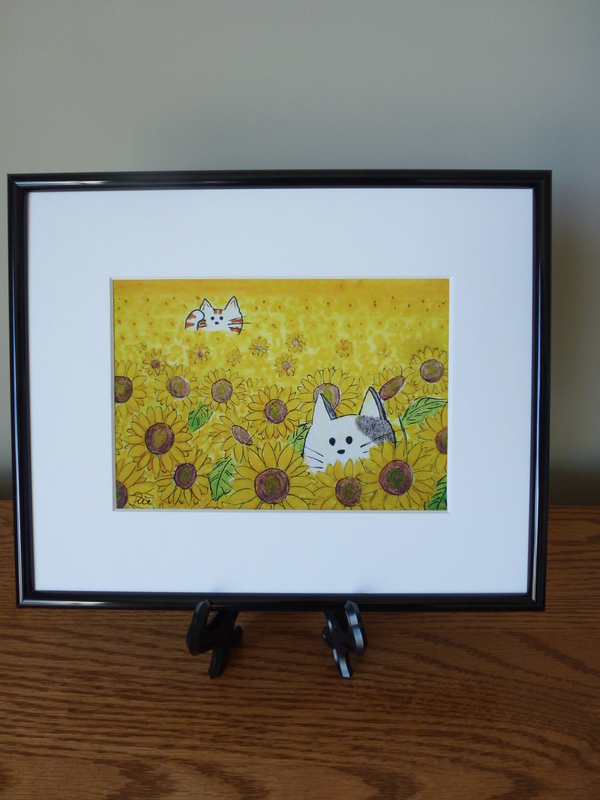 I was looking for something fun to draw and I came up with the idea of cats in sunflower field. 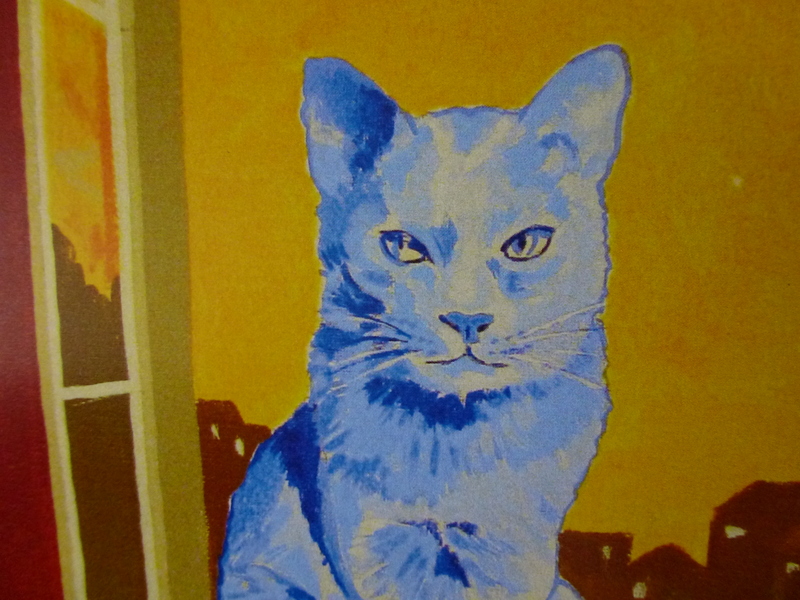 That was the start of my portfolio of cats. Currently, I have a super friendly over weight black male cat, a picky thin white female cat and a beautiful but very loud bird, Sun Conure. 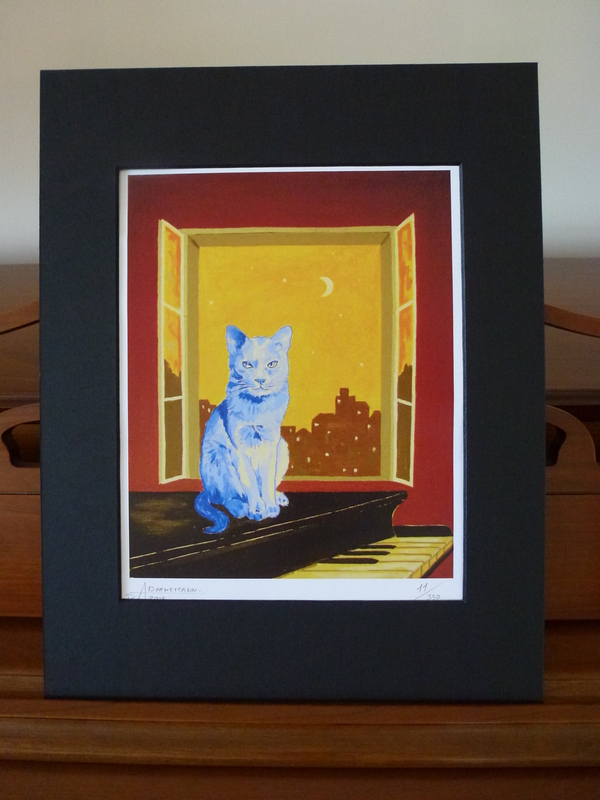 I’d like to thank Rie Kaminsky for her participation and for the whimsical cat prints she provided. 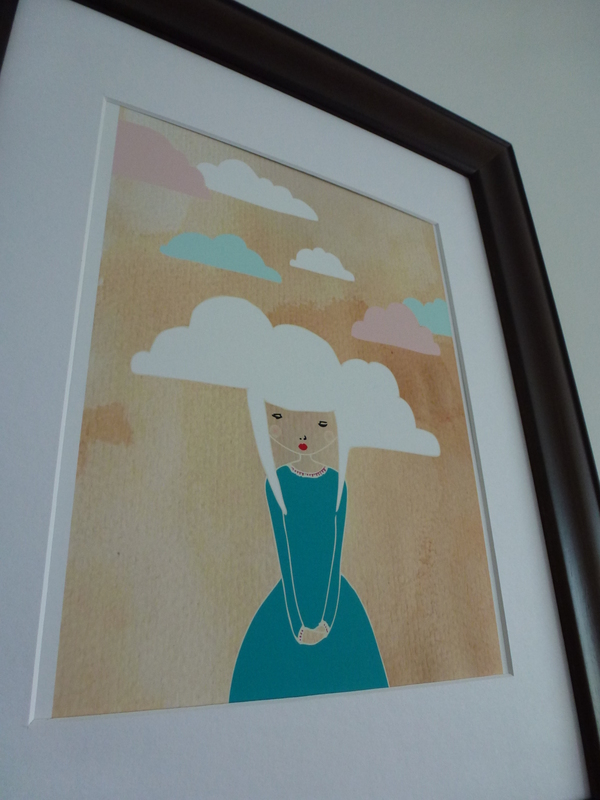 Laura is an amazing textile artist and the prints she sent me are spectacular. The originals are done on canvas having more depth and texture. 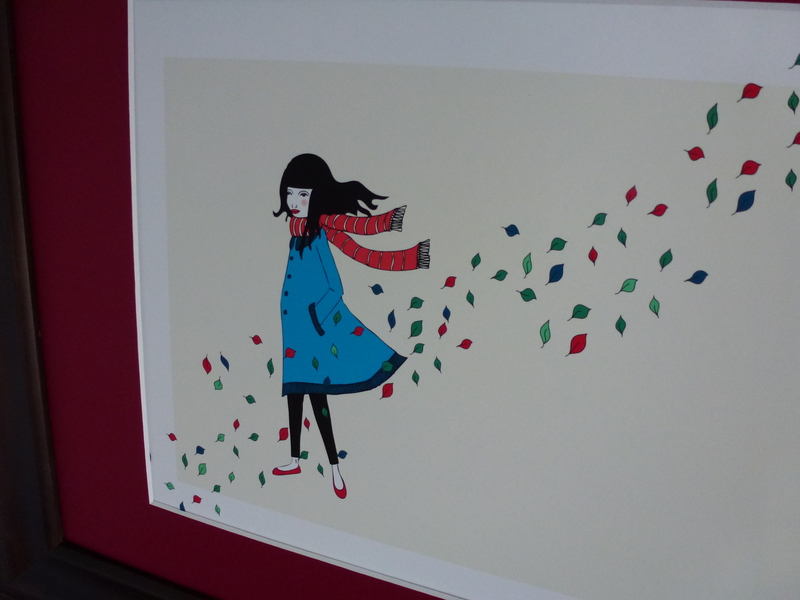 Both these prints portray movement, mood and a contemporary feel from her use of simple lines and intriguing colors. 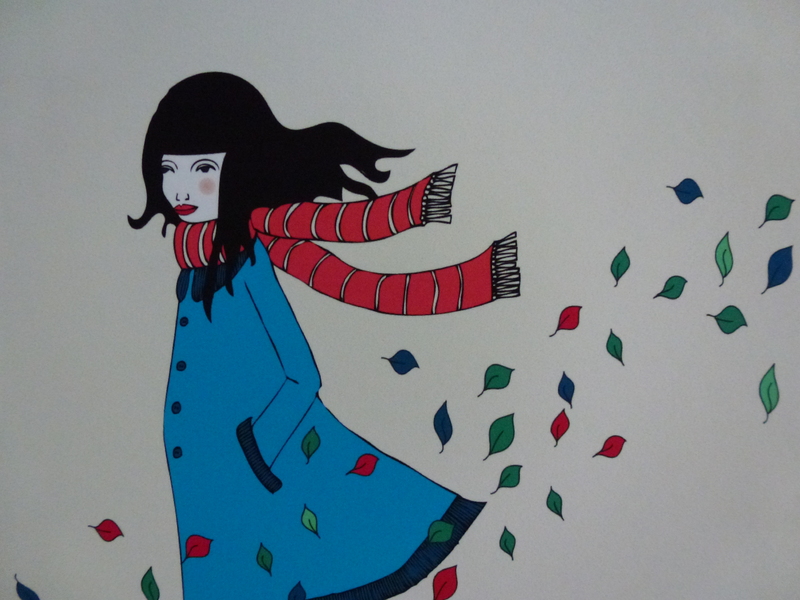 Illustrations full of fun and color make her a whimsical artist to notice. These prints appeal to my love for nature and the weather so I decided on matching walnut frames for an earthy look. Each day of every season has so much to appreciate. God’s creation is awesome! 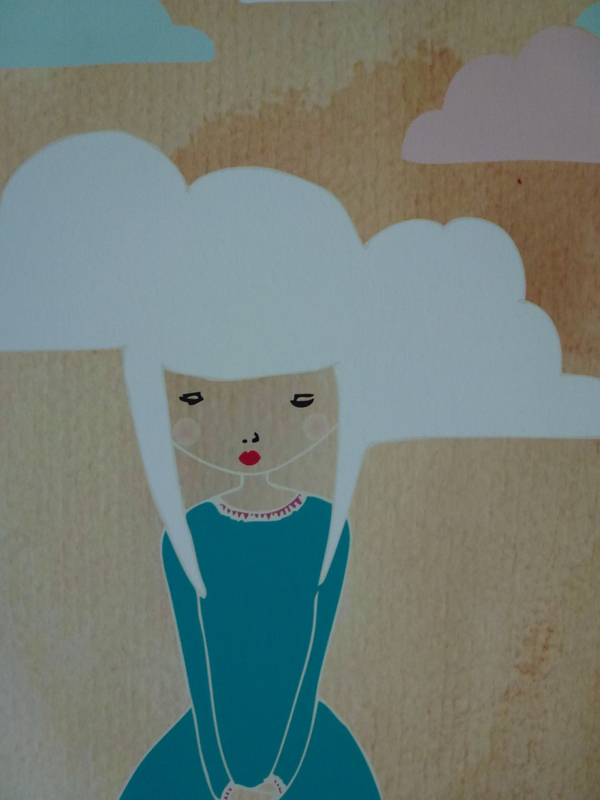 Hello my name is Laura, I am an illustrator and designer working with textiles and print. I am originally from the north of England but for the last seven years I have called Amsterdam in The Netherlands home. I live here with my husband and two slightly wild but lovely children. I graduated in Textiles from Goldsmiths College at the University of London in 2003. After graduating I moved to Amsterdam and started working in the costume Atelier of the National Ballet and Opera house, which was both amazing and daunting (not speaking that much Dutch at the time). I now work freelance as a designer and textiles artist. My handmade canvases are unique and are created using a selection of new and reclaimed fabrics. My work is composed of subtle lines and color combinations produced through layering, piecing and sewing fabrics together. I draw inspiration from my every day environment and hope that the way in which I recapture the landscape or moments of ordinary life allows people to appreciate them with a fresh perspective. Laura Amiss Design is a registered company, everything you see in my shop is designed, crafted and built by me. 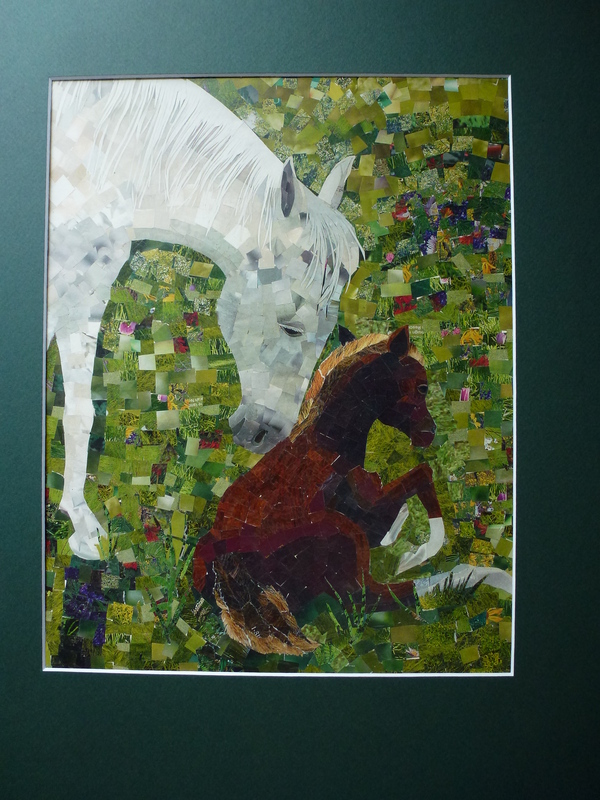 My two passions are textiles and illustration, I have endeavored to combine the two in my work. I’d like to thank Laura Amiss for her participation and for the beautiful prints she provided. Sarah Mason is the talented artist and owner of Emetsigns . 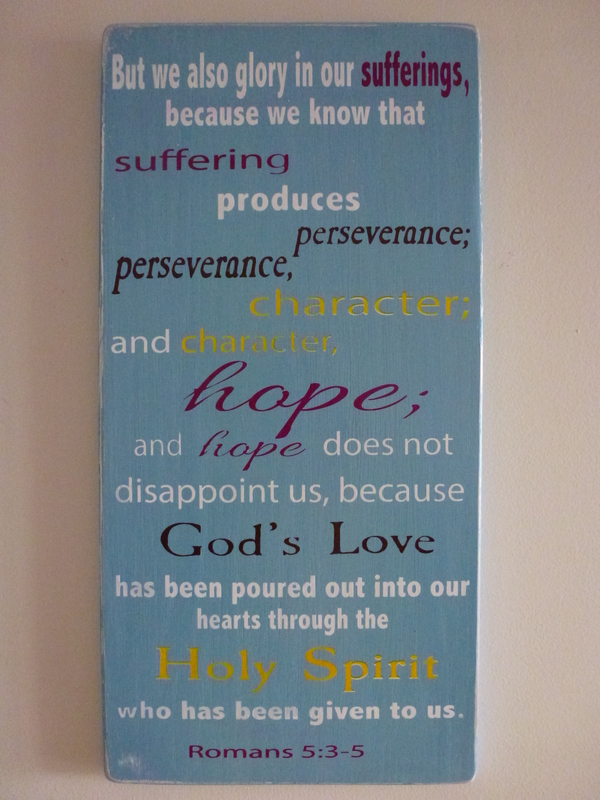 Her hand-made wooden signs consist of an assortment of different bible verses. Custom signs can be made with your choice of scripture and color. Emmetsigns beautifully showcases the Truth – God’s word. 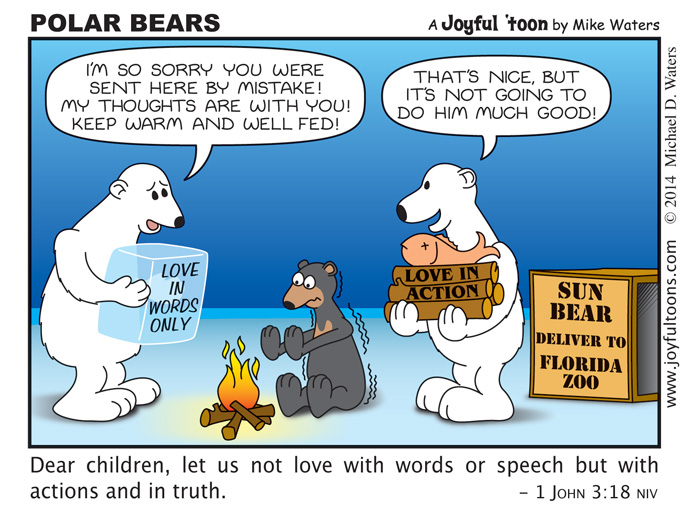 Sarah’s love for God’s word is lovely and I’m thankful to be featuring her art on today’s ARcTic post. This oak sign is painted a light blue with the lettering done in white, gold, brown, and magenta. I like the cheerful colors for this particular verse. Paul is telling us that the Christian experience isn’t always easy. While that much we know, I like to be reminded of what Paul tells us suffering can do for us; How God uses the difficult times to make us the Christians He wants us to be. How many times have you heard a scripture, but never “heard” the scripture. So often we hear or read our bibles with our head and somehow it misses the journey down to our hearts. Can you imagine what life would be like if we embraced the TRUTH that is present in God’s word, if we truly embraced Him. As Hebrews 4:12 states, the bible is not dead, or static, or outdated, it is ALIVE and full of TRUTH. It is life breathing and life giving and so often we choose to embrace the lies of this world over the truth of God. As I am on this adventure called life, God is bringing me to new, deep places with Him that I have never known before, and it is all through this book we so often dismiss as irrelevant. He is giving me a passion for His word and His truth that I never knew was possible. Along the way He has encouraged me to seek out truth, emet, in every circumstance, and let me tell you, it is NOT an easy journey. I am a very visual person, so for me, to have a visual reminder of the truth of God in the midst of a trial is very helpful to my heart. And that has led me here, to creating artwork to hang in homes that points us back to the truth. The truth that is sometimes hard to hear, but yet always true, that life is just not about me, i am called to love when it is hard, i am called to serve, God is everything and in everything, and I could go on and on. Along with each sign will come a short commentary on the verse and what it means for you and your family when you hang it in your home. My prayer is that this becomes more than just artwork in your home, but truly a place where God works to change hearts and bring us back to Him, the ultimate TRUTH. I’d like to thank artist Sarah Mason for her participation and for the beautiful sign she provided. 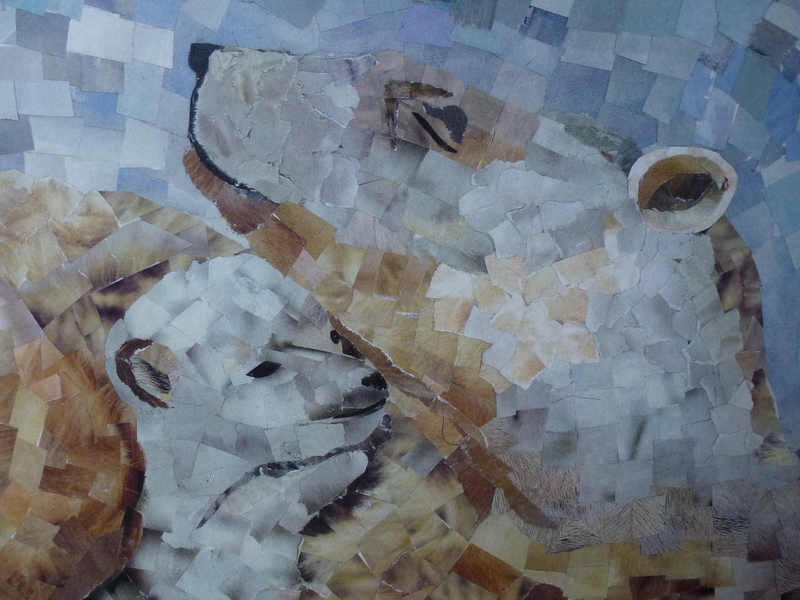 Hana, animal lover and artist, creates outstanding animal prints using cut and torn paper. I find her process amazing. 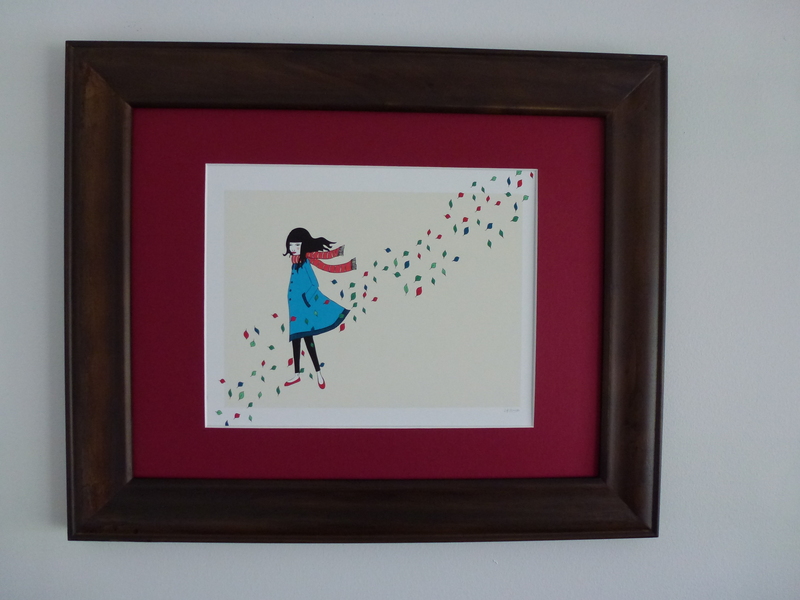 Featured on today’s post are two of Hana’s prints with a Mother’s Day theme. Both prints measure 13 x 19 and I’m showing them here only with a mat until I get the perfect frame. 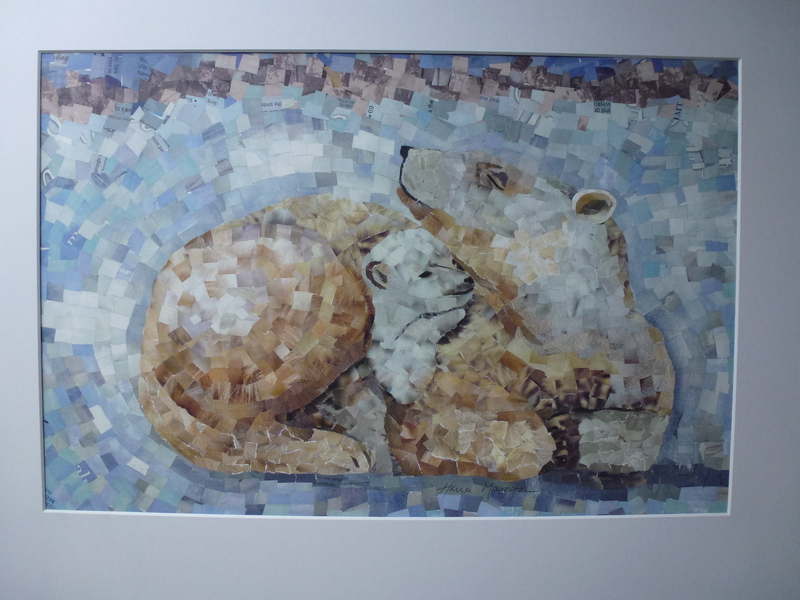 Her work is nothing short of spectacular; it’s a given that I’d love this polar bear and cub collage! While the bible doesn’t say that every woman should be a mother, those that enjoy the blessing of motherhood take on an unique and important responsibility. A mother plays an ongoing role in the life of her child whether they are an infant, toddler, teenager, young adult, and even as an adult with a child of his/her own. A mom’s love, care, nurturing, and encouragement never ceases! 2 that you may fear the Lord your God, you and your son and your son’s son, by keeping all his statutes and his commandments, which I command you, all the days of your life, and that your days may be long. Deuteronomy 6:1-9 gives us spiritual instruction for parenting. The ‘fear of the Lord’ is the awareness of God, which influences our lives.What we do as parents greatly impacts the lives of the next generations. We are to pass on the heart and love for the Lord as well as knowledge of the Lord’s commands. My name is Hana and I am finally free to follow my muse full time! I am inspired by the Impressionists, especially Vincent Van Gogh, the Prince of Passionate Creation. I’m not religious, but let me explain the name of my shop. It comes from two of my passions: love for our animal friends, guides, and mentors, and the angels that are ever present to inspire, guide, and watch over our dramas. I have always felt that animals are our beautiful, wise, ever-loving companions; the angels are here to assure us that we are loved and loving, powerful beings, meant to create a peaceful, loving world. Art is my journey; an exploration of myself and the universe, and my soul’s expression. 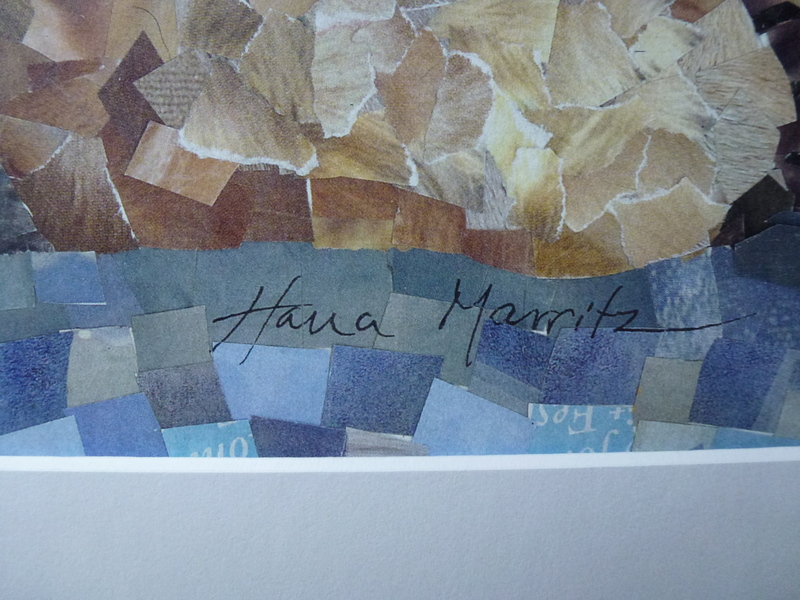 I’d like to thank artist Hana Marritz for her participation and for the beautiful prints she provided. 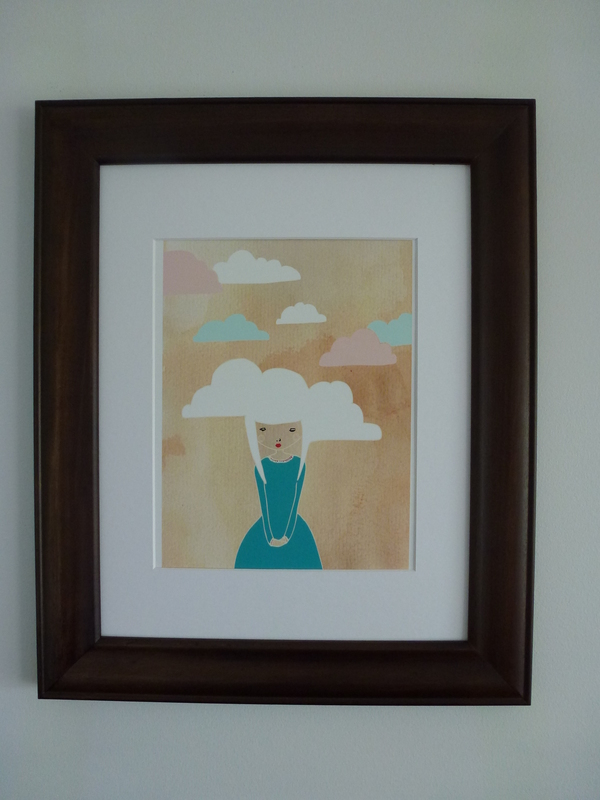 Heart Stone Gallery is the Etsy shop of Kerri Michaud, artist and high school art teacher. 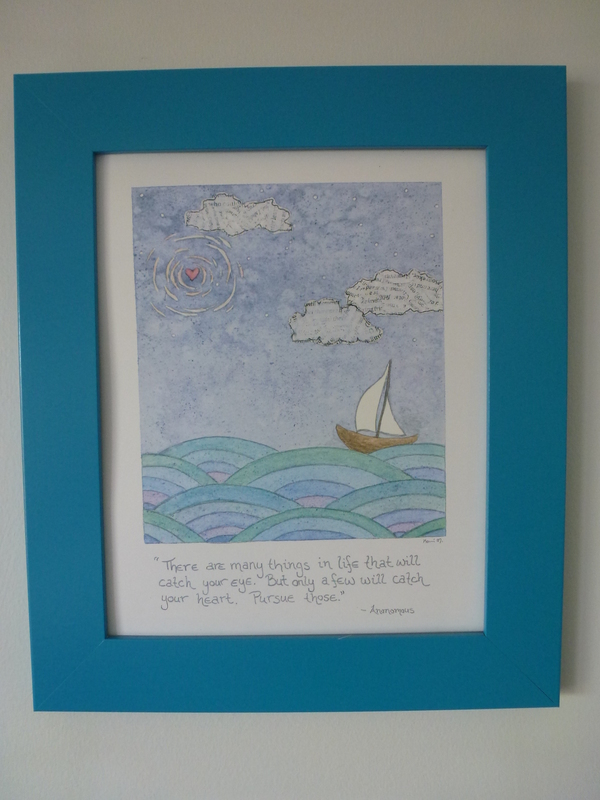 Kerri used the Michael Nolan quote in her watercolor and collage print “Follow Your Heart” shown below. She’s applied that principle in her life by pursuing her love for art. Her artistic talent and teaching is an inspiration to many. 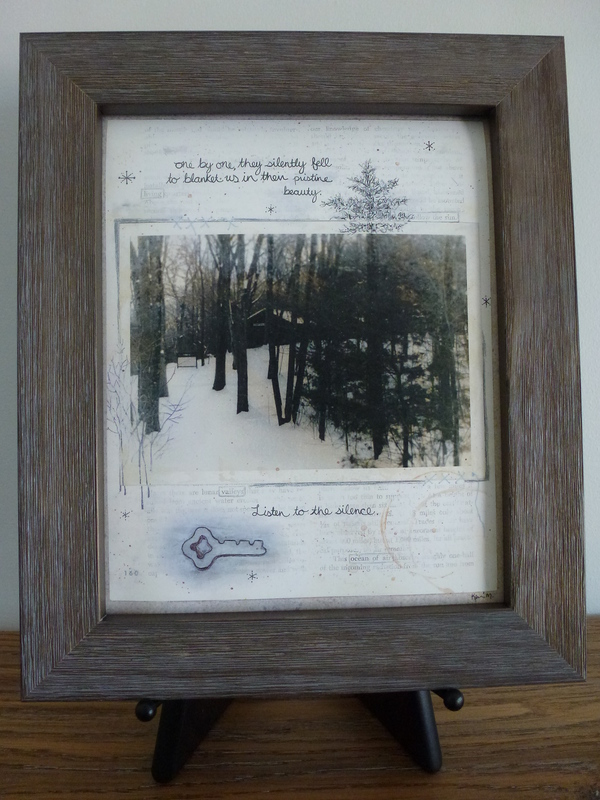 Pieces of old books and a photo are the collage materials for “Listen to the Silence”. 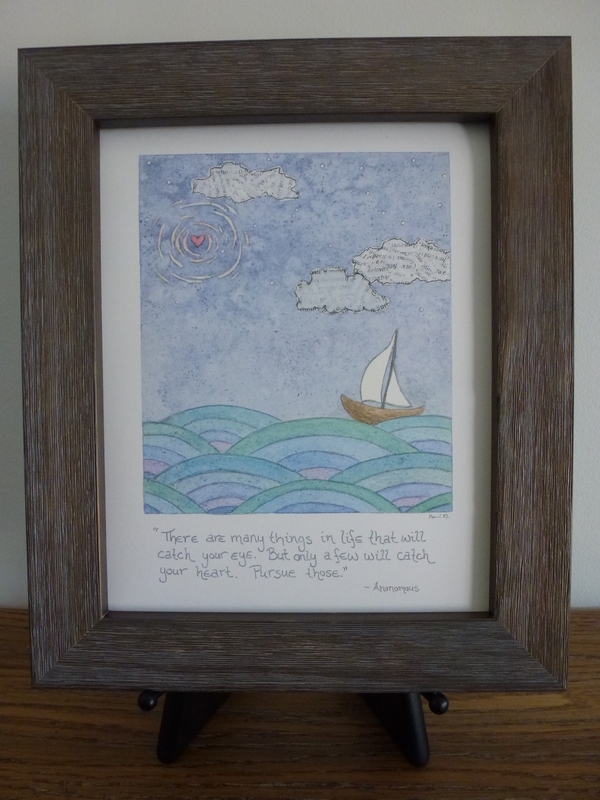 I chose a weathered wood frame for both; however, the little boat at sea looks good in this blue frame giving it a more contemporary look. I like thinking about the heart quote found in Matthew 6. Jesus was teaching His disciples and the point made is really about relationship, i.e., our relationship as Christians to our heavenly Father. So on our daily, earthly journey consider where our treasure is and if we’re seeking first the kingdom of God and His righteousness. I am an artist and high school teacher in Connecticut. Before going back to college for my art education certification, I completed my bachelor’s degree in art with a concentration in ceramics. I have always had a passion for art and loved the freedom it allows me to have in expressing myself. I enjoy passing my knowledge onto my students and seeing their pride in their completed work. My latest adventure has been opening my own shop on Etsy. Although I like working with clay and photography, I am most drawn to watercolors. Many of my paintings come from my own photographs. This quote by artist Georgia O’Keeffe, is an inspiration for me to look at the quiet details in nature that are often over looked and try to capture them in my art. ‘When you take a flower in your hand and really look at it, it’s your world for the moment. I want to give that world to someone else’. My current artwork combines watercolors with collage and text. 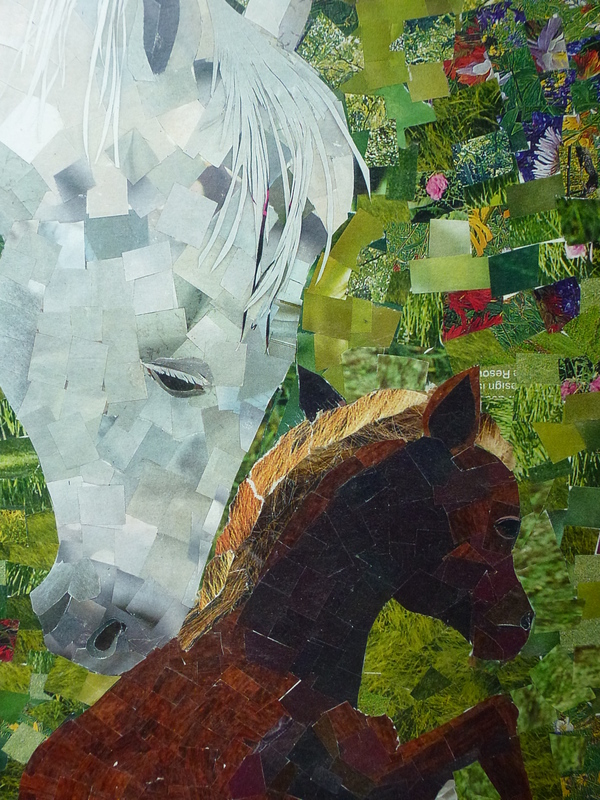 My materials come from old books, scrapbook paper, and magazines. I’m having fun playing with different patterns, layers, textures and words or quotes that speak to me. I’d like to thank artist Kerri Michaud for her participation and for the beautiful prints she provided.